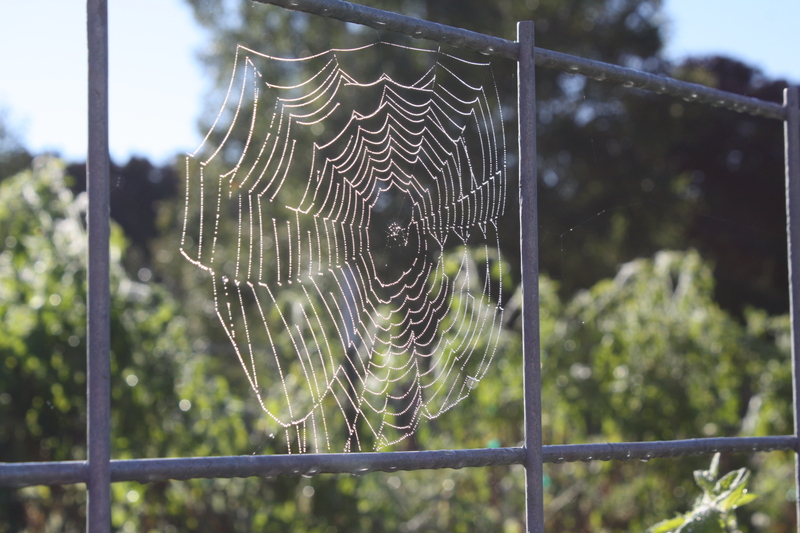 A pretty cobweb on the tomato trellis. Another work of art that greets us in the morning dew. The first day of Autumn is just around the corner and it feels like it out in the garden. Damp dewy mornings and we busy ourselves with other duties while we wait for the garden to dry a bit. Working with cold wet clothes and chilly wet fingers at this time of year is never fun. Exciting news to report. 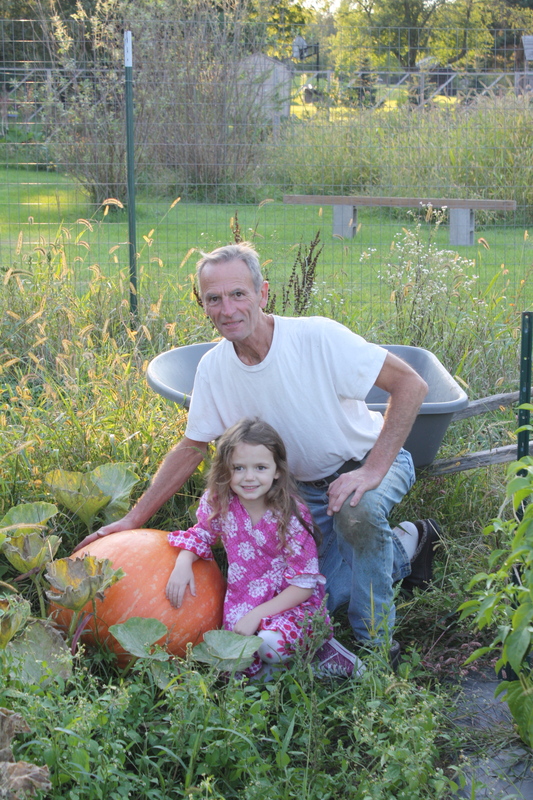 Scott harvested all the Sweet Potatoes this week-by hand! 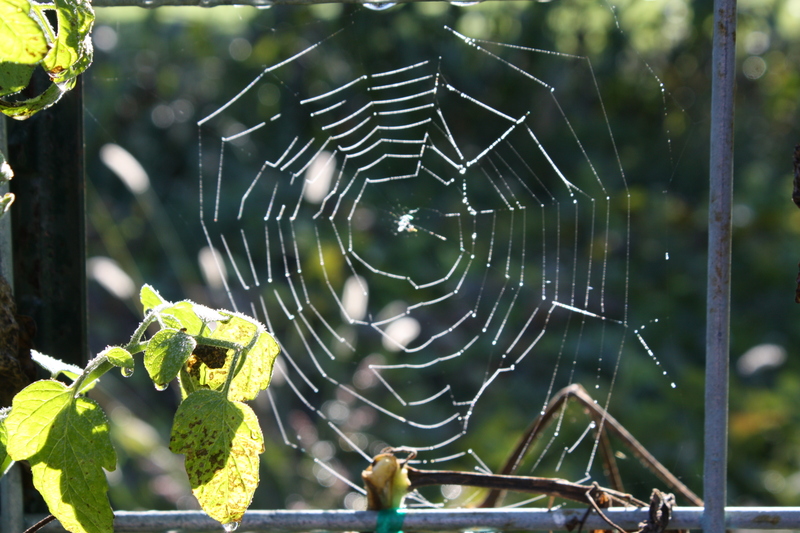 The vines were slightly nipped by a light frost and it was time to harvest as growing stopped with the vine damage. A bumper crop. Our best ever and we are thrilled….Thank you Uncle Jim for your help!!!!! 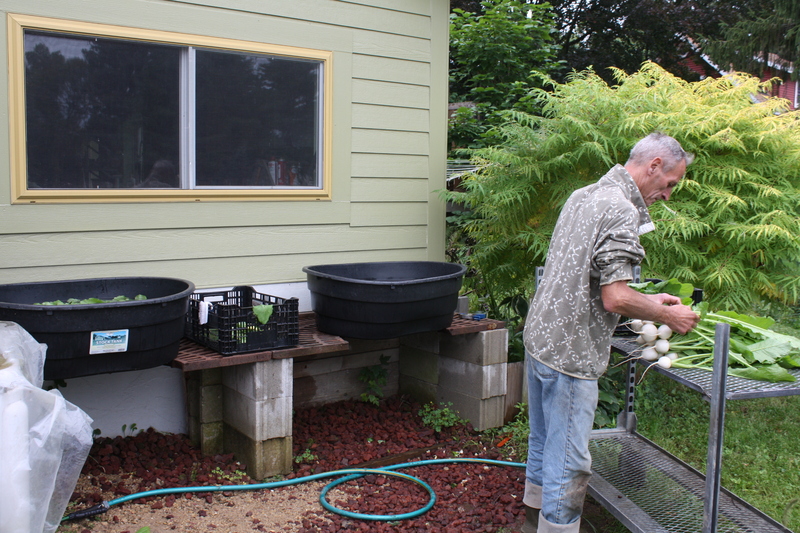 We planted 500 slips in Spring and Scott weighed out just over 465 pounds when he put them in the greenhouse to cure. Sweet potatoes taste almost like a regular potato if eaten right after harvest. They need a period of time in high heat to convert the sugars and sweeten up a bit. We will let them sit in the warmth of the greenhouse for a week or 2 and then Tons!!! 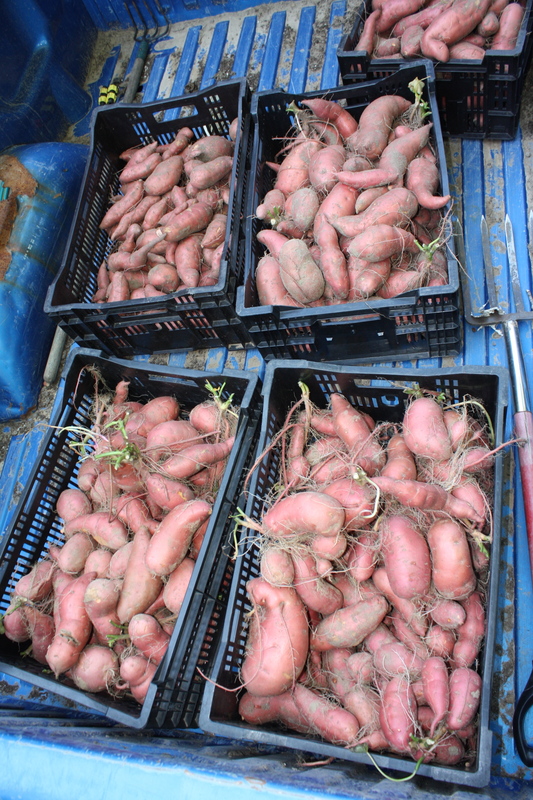 of Sweet Potatoes in the final weeks of the CSA. Sweet potatoes coming in from the field. 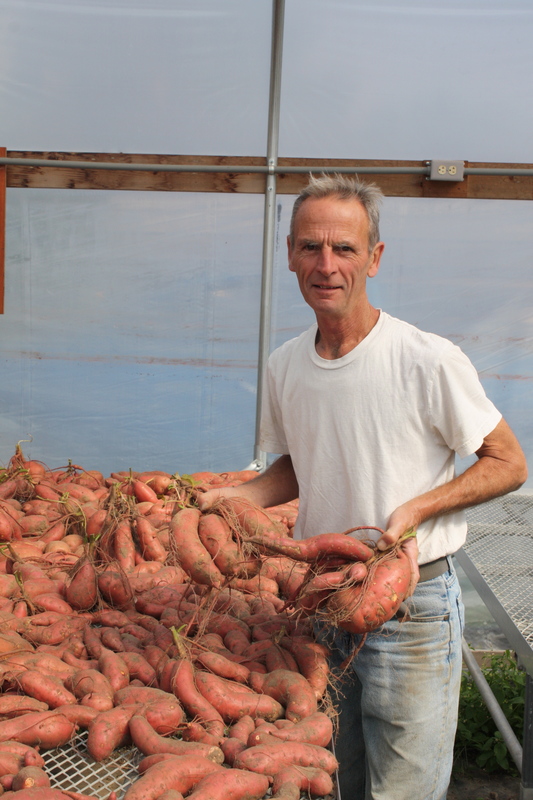 Scott with some beautiful sweet potatoes in the greenhouse. 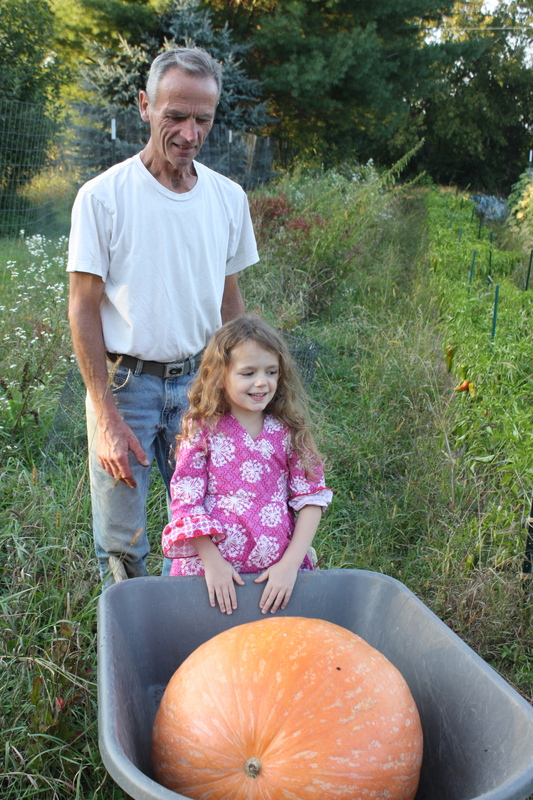 We also decided to harvest Maeve’s big pumpkin. We noticed a critter was nibbling on a neigboring pumpkin and did not want this beauty to get a chomp or 2 on his backside. Getting ready to harvest our great pumpkin. He’s up and ready to be taken out of the garden. 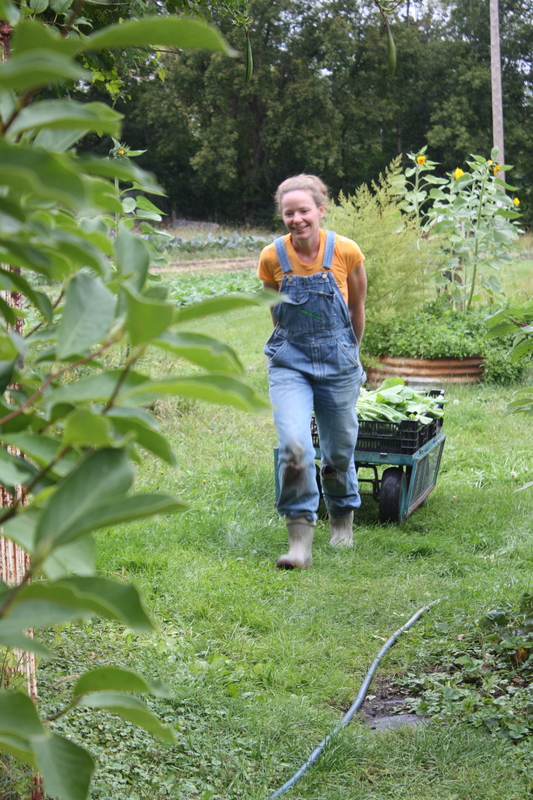 Lots of wonderful produce yet to come out of the garden and hoophouse. Perhaps a few more tomatoes as the weather report is saying warmer days this week. We will try for a few more for everyone. It has been a good tomato year for us but it would be nice to taste a few more in these first days of Autumn. Next week a big leek harvest of the delicious thick Autumn leeks and a great crop of thick jumbo stew carrots. We pulled a few to test this week and they are fantastic. A last big crop of beets in the coming weeks and ALL that fall spinach (including Red Kitten!) is just starting to leaf out beautifully. Oh, and it does look like all that popcorn that was blown down flat and Scott spent all that time standing back up is going to do something.. I really think there will be some popcorn. We are afraid to peek just yet with fear of being disappointed but the ears are thick and the stalks are slowly starting to dry. I know I said it before but this really is my favorite time of year. 329 pounds of tasty treats from the garden this week. Happy Autumn Everyone! Pac choi-I have been looking forward to this return. A nice juicy head of a variety called White Flash. Cabbage all soaked and ready to be put in the cooler. 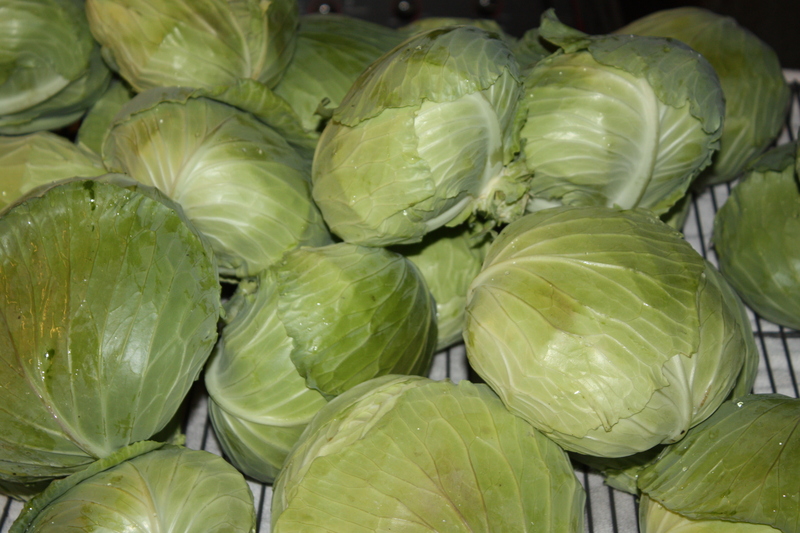 Cabbage-Those fun mini flat heads that we like so much. Great flavor. Perfect for salads and stir fry. Storage Onions-The first of the storage onion harvest. We have let them dry down and cure for many weeks and they are ready for the shares. 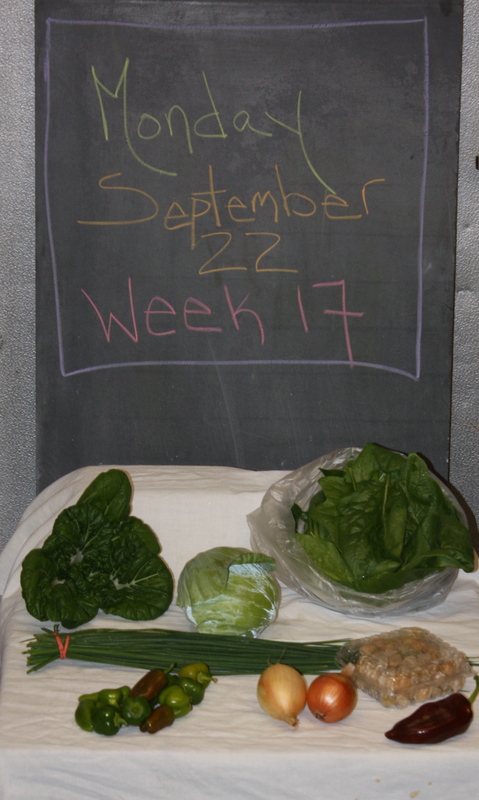 These will appear in the final weeks of the CSA. Stronger flavor then the sweet summer onions earlier in the season. Mini Snack Peppers-An assorted bag of these delicious mini sweet snacking peppers. The last harvest for the season. Spinach-BIG! delicious leaves. Full of flavor. Enjoy. Chives-A nice garnish for soups or salads. Great with eggs. Pac choi-I have been looking forward to this return. 2 heads in Full Share this week. A nice juicy head of a variety called White Flash and another taller variety called Win-Win. Peppers-A bag of “mildy hot” Anaheims and a bag of jalapenos. This week will finish the season with peppers for us. Lettuce-We have made the transition to the cooler lettuces and this is a delicious mini head called “bambi”. Beans-Perhaps the final bean harvest of the season. Salad Turnips coming up from the hoop house. Scott at the washing station cleaning the salad turnips. Salad Turnips-They are back! Japanese Hakurei Turnips. Our favorite salad turnip. The texture is as smooth as butter and mild flavor. Eat raw in salads or sliced thin on sandwiches. Raw is our prefered. Can be lighty sauted too for stir fries. Greens can be eaten too. Chives-a nice garnish for soups or salads and great with eggs. Summer Squash-A few tender little guys and this is the end of this crop for the season. Spaghetti Squash- Baraboo Full Share only. Celery-Erdman Full Share share only. Tomatoes-A few choice slice or paste varieties. Sadly, this may be the end of the ripe slice/paste tomato season for us. 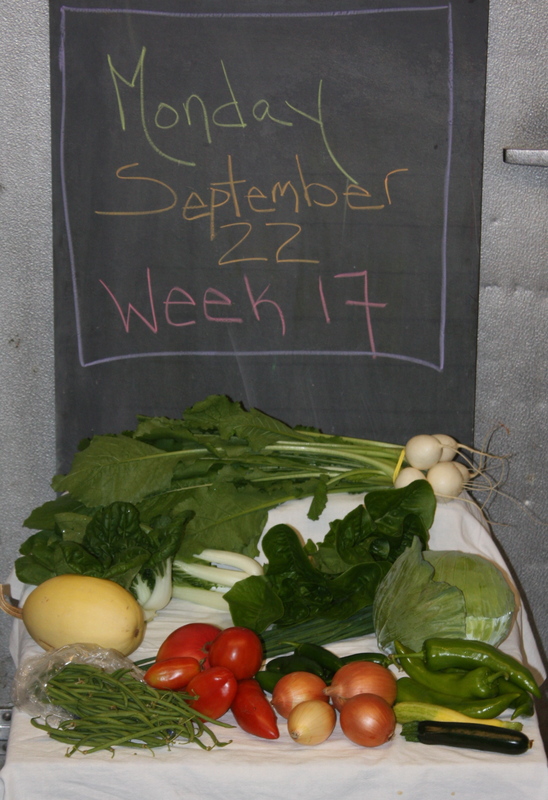 BEST GUESS FOR NEXT WEEK-SPINACH, LEAF LETTUCE, KALE, LEEKS, WINTER SQUASH, CARROTS AND MORE……….